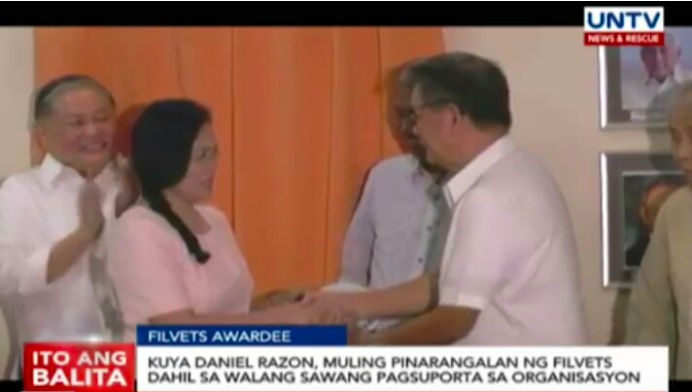 For the third time, Filipino War Veterans Foundation, Inc. (FilVets) awarded Kuya Daniel Razon as Outstanding Partner, citing the UNTV-BMPI President and CEO’s continuous support for the foundation through UNTV News and Rescue and Radyo La Verdad. 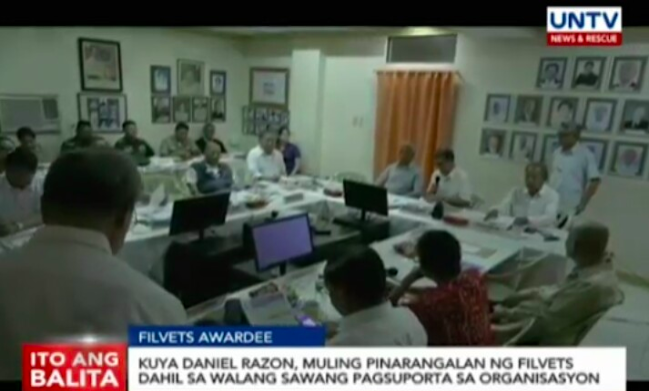 FilVets is a non-profit organization that helps Filipino war veterans and their dependents in terms of welfare needs such as giving medical assistance and helping them claim pensions. In the awarding event held on May 13 this year, FilVets Chairman Mr. Renato de Villa expressed his gratitude to all their partners for their unceasing support to their organization. “We feel that we owe it to those who helped us a lot to recognize their work for the sake of our veterans,” de Villa said. Ms. Annie Rentoy, Radyo La Verdad Station Manager receives the award in behalf of Kuya Daniel Razon and, expresses her earnest appreciation to FilVets’ recognition to UNTV and Radyo La Verdad. Kuya Daniel has been supportive of the foundation’s mission to reach their beneficiaries faster, providing FilVets free broadcast through UNTV’s facilities. Radyo La Verdad Station Manager Ms. Annie Rentoy received the Plaque of Appreciation in behalf of Kuya Daniel Razon. Ms. Rentoy also pointed out that as a partner of UNTV, FilVets help the station in its medical missions.